The Arctic Ocean and the Southern Ocean (the ocean around Antarctica) have different characteristics than the rest of the world's oceans in terms of circulation, formation of bottom water, convergent and divergent water masses, productivity, ice cover, and biological diversity. In addition, polar oceans are inextricably linked to climate change, and hence continued to be studied in the context of global warming. 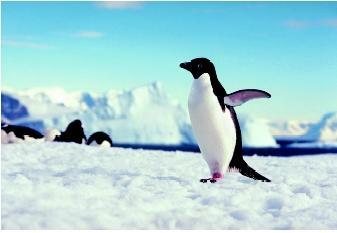 The water surrounding the Antarctic continent is often called the Antarctic or Southern Ocean. The Antarctic Circumpolar Current (ACC), at 0 to 200 meters (0 to 650 feet) in depth, is the dominant surface-water circulation pattern in this polar region. * The ACC, a geostrophic current , is influenced by the prevailing Antarctic wind patterns and is constrained by the adjacent landmass, the Antarctic continent. The ACC, also called the West Wind Drift, flows from west to east around the Antarctic landmass. In polar oceans, seasonal melting of sea ice creates gaps in the ice cover, thereby allowing more sunlight to penetrate the surface waters. The favorable light conditions stimulate phytoplankton growth and yield surges in primary productivity. To the north of the ACC is the warmer, more saline (salty) Subantarctic Surface Water. Between the ACC and the Antarctic landmass is the East Wind Drift, a counter-current that flows from east to west. Antarctic Bottom Water (AABW) has average salinity, temperature, and density values of 34.65, −0.5°C (31°F), and 1.03 gram per cubic centimeter, respectively. The majority of the AABW (the Earth's densest water mass) is formed in the Weddell Sea during the winter when the sea-ice formation process produces cold brine that sinks and mixes with Antarctic Circumpolar Current water. This water mixture subsequently settles along the continental shelf , slowly spreading along the seafloor in the form of a northward-flowing sheet below the North Atlantic Deep Water. The Antarctic Deep Water (AADW) which is formed in less extreme latitudes and is less salty and warmer than AABW, flows northward near the surface until it reaches the Antarctic Polar Front Zone, where the AADW sinks and continues to flow northward beneath the warmer, less dense North Atlantic Deep Water. The Antarctic Polar Front Zone encircles the Antarctic continent between 50°S and 60°S latitude. Antarctic Intermediate Water (AAIW) includes water from the Antarctic and is formed by mixing below the surface in the Antarctic Polar Front Zone. The AAIW flows northward beneath the South Atlantic Central and the South Pacific Central Waters and above the North Atlantic Deep Water until it converges with the Arctic Intermediate Water and North Pacific Intermediate Water. The Arctic Ocean is divided into the Eurasian and Canadian basins by the Lomonosov Ridge, a bathymetry feature that extends from Greenland past the North Pole to Siberia. 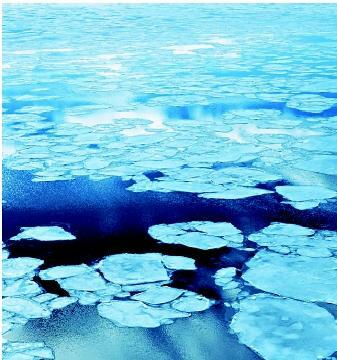 Arctic Ocean surface water (0–200 meters or 0–650 feet) predominately flows counterclockwise in the Eurasian basin and clockwise in the Canadian basin. The general direction of Arctic Ocean water movement below the surface is counterclockwise. The primary site of water export from the Arctic to the Atlantic Ocean is the Fram Strait, which has a sill depth of 2,600 meters (8,530 feet) and is located between Greenland and Spitsbergen. Water from the Atlantic is introduced into the Arctic by the Norwegian current that flows northeastward passing between Norway and Spitsbergen. The Bering Strait with a shallow sill depth of 45 meters is located between Alaska and Siberia and serves as the water exchange site for the Arctic Ocean and the Bering Sea. The amount of water exchanged through the Bering Strait is approximately one-tenth of that which is exchanged through the Atlantic Ocean pathways. Arctic Intermediate Water, which is actually formed in the subarctic region, flows southward beneath the North Atlantic Central Water, meeting the Antarctic Intermediate Water. Deep (Bottom) Water exchange between the Arctic, Atlantic, and Pacific Oceans is restricted by seafloor bathymetry. There are three distinct marine water masses located within the Arctic Ocean: the Arctic Surface Water (0–200 meters); the Atlantic Water (200–900 meters or 650–2,950 feet); and the Arctic Deep Water (900 meters–seafloor). The Arctic Surface Water is divided into three layers: the surface, subsurface, and lower surface layers. Each of these water layers has distinct salinity and temperature characteristics. The Atlantic Water (AW) is located below the Arctic Surface Water (ASW) and above the Arctic Deep Water (ADW). The average temperature (3°C [37.4°F]) of the AW is warmer than both that of the ASW (−1.9°C to −1.0°C [28.6°F to 30.2°F]) and the ADW (−0.8°C to 2.0°C [30.6°F to 35.6°F]). The AW has a higher salinity range (34.8–35.1) than that of the ASW (28.0–34.0). The ADW, with a salinity range of 34.9 to 34.99, represents approximately 60 percent of the Arctic Ocean total water volume and is comprised of the Norwegian Sea, Greenland Sea, Eurasian basin, and the Canadian basin deep waters. In the polar oceans, ice exists primarily in the form of either icebergs (glacier fragments) or sea ice . Sea ice, the major form of ice in the polar oceans, is formed by a sequence of events that occur once suitably cold (−1.8°C [28.8°F]) conditions exist to freeze sea water. After sea water begins to freeze, frazil ice (small ice crystals) is formed. Frazil ice eventually accumulates to form grease ice (surface ice slicks), which in turn accumulates to form small ice chunks and floes that aggregate together to form a solid ice cover. Over time this solid ice cover will thicken into sea ice. Sea ice is present in the Arctic Ocean in three forms: the Polar Ice Cap, pack ice, and fast ice. Unlike Antarctica, the Arctic Ocean has no central landmass. Polynyas are large areas of open water surrounded by sea ice. Polynyas can range in size from a few square kilometers to more than 50,000 square kilometers (more than 19,000 square miles). Polynyas, which are of biological and physical interest, are produced by either the removal of sea ice or by the prohibition of sea-ice formation. Nearshore polynyas are generally formed by strong surface winds blowing sea ice offshore, leading to sea-ice removal, surface-water exposure, and, in some cases, new production of sea ice. Polynyas also exist in the open ocean as a result of convection, a process that allows warmer subsurface waters to rise above sinking colder surface waters. Recurrent polynyas play significant roles in the marine ecosystem by triggering early and intense phytoplankton production. Additionally, polynyas serve as wintering grounds for marine mammals. Primary productivity is affected by the availability of sunlight, carbon dioxide, and inorganic nutrients (nitrates, phosphates, and trace elements). In the marine environment, nutrients are recycled from phytoplankton to animals to decomposers (such as bacteria) before returning to phytoplankton. One of the most effective pathways for nutrients to be re-incorporated into phytoplankton is through the upwelling of nutrientrich deep waters in which the bodies of marine plants and animals have previously decomposed. In the polar oceans, phytoplankton blooms (explosive population growth) occur during the summer months as a result of favorable light conditions which lead to short-term increased primary productivity. During these months, the Antarctic Ocean's upwelling zone exhibits some of the Earth's highest primary productivity. In the Arctic and Antarctic Oceans, the sea-ice formation and melt processes also play important roles in primary productivity. Frazil ice is mixed with surface and subsurface water, entrapping phytoplankton between ice crystals that are eventually incorporated into pack ice. The phytoplankton (mainly diatoms ) will grow within the sea-ice brine channels, causing the pack ice to appear greenish-brown. During the yearly ice melt process, the diatoms are released back into the water, resulting in local increased primary productivity. Marine biodiversity generally decreases towards high latitudes, reaching a minimum in the polar oceans. The few marine species that exist in the polar oceans tend to grow at slower rates, live longer lives, attain larger sizes, and have fewer offspring than their tropical counterparts. In addition, the few marine species that are able to withstand the relatively harsh polar conditions tend to exist as larger populations than their more diverse tropical counterparts. Polar habitats support populations of diving birds such as penguins and puffins, and marine mammals such as whales, seals, and polar bears. These animals are more visible than the invertebrate and microscopic communities found in the water column, on the seafloor, and in sea ice. biota reside and feed within the water column, the Arctic Ocean biota reside and feed throughout the water column and along the seafloor. Among the larger populations of biota present in the Antarctic are at least five types of seals (crabeater, elephant, leopard, ross, weddell), six varieties of penguins (adelie, chinstrap, emperor, gentoo, macaroni, king), and five whale species (blue, sperm, orca, mink, southern bottlenosed) in addition to various seabirds, squid, fish, krill, copepods, and diatoms. The major sea mammals associated with the Arctic Ocean are whales (beluga, orca, bowhead, California gray, narwhal), polar bears, sea otters, seals (ringed, ribbon, bearded, spotted), and walruses. Arctic birds such as the tufted puffin, laysan albatross, and spectacled eider rely on the Arctic Ocean as a primary food source. These birds feed by diving into the water for fish (e.g., arctic cod), crustaceans, and/or mollusks. In the Arctic Ocean, the dominant types of phytoplankton and zooplankton are diatoms and copepods, respectively. Water-column productivity of the shallow Arctic marginal seas encourages the growth of productive benthic (bottom) communities that include mollusks, polychaetes, brittle stars, and amphipods, which support bottom feeding by the spectacled eider, walrus, bearded seal, sea otter, and the California gray whale. SEE ALSO Climate and the Ocean ; Global Warming and the Ocean ; Ice at Sea ; Marine Mammals ; Marginal Seas ; Ocean Currents ; Ocean-Floor Sediments ; Radionuclides in the Ocean ; Sea Water, Freezing of . Pickard, George L., and William J. Emery. Descriptive Physical Oceanography: An Introduction, 5th ed. New York: Pergamon Press, 1990. Polar Programs. National Science Foundation. <http://www.nsf.gov/home/polar/> . Teachers Experiencing Antarctica and the Arctic. Rice University. <http://tea.rice.edu/> . * See "Ocean Currents" for depictions of the ocean surface currents and deep currents.